Well here’s the deal. I’m tired of the on/off/on again shenanigans, claims and counter claims that have surrounded them for the past few months; Tyler’s fallen off the wagon (and stage) and is out; He says he quits to do solo stuff; Joe Perry says they’re auditioning singers, and rumours fly of people being asked but declining, but with no substantial proof. Then Joe Perry gives his latest (average at best) solo record in Classic Rock Magazine, complete with big anti-Tyler interview… Perry & Tyler release statements, lawyers letters and generally say Not Nice Things in the press… but then, suddenly they announce they’re headlining Download. And then Europe. Really? It’s all sorted that quickly? Previously, Aerosmith have admitted that groundbreaking book “Walk This Way” was not only a way to conquer their demons, but a hell of a marketing ploy to put them back in the public eye. Given how awful Just Press Play and Honkin’ On Bobo actually were, anyone else just seeing this carry on as a snug little PR trick? That was the line from The Usual Suspects that pulled together the fantastic twist at the end of the flick. I get the feeling that this coming together and very public joining of arms and singing campfire songs is the final act. Aerosmtih need to come out with a rip roaring record within the next year to convince the me, and the world, that they are still relevant. 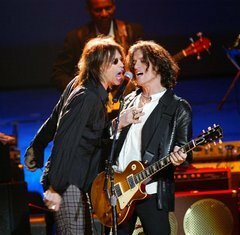 At the end of the day, to me it smacks of one of two things – an elaborate PR campaign (if it is, it’s genius and worked perfectly) or an ultimatum backfiring from one or both sides of the Perry/Tyler divide; someone realising that they both need each other – who really cares about Joe Perry without Steve Tyler? Who really cares about Steve Tyler without Aerosmith? Either way, they’re back in the saddle, hopefully this time without the toys being thrown out of the pram for a while… they’ve used up all of their nine lives with me. I endorse this event and/or product. Seriously, good blog, sir. They need to stop muddling around and get a new record out. And even if it was a PR campaign and it brings in more people than would otherwise have seen them, it still ALSO makes them look like flailing prats too. Quit messing around, guys!